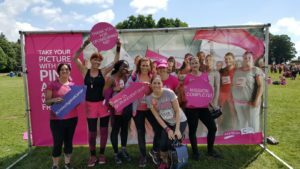 Altrincham-based Jefferies Solicitors has once again raised a significant amount of money for charity – this time by conquering the Three Peaks challenge and Race for Life’s Pretty Muddy. In what has turned out to be a bumper month for charity donations, Jefferies Solicitors raised nearly £1,500 in June for the Children’s Adventure Farm Trust (CAFT) and Cancer Research. Solicitor Michael Mawdsley took part in the National Three Peak challenge, scaling the UK’s highest mountains, Ben Nevis (1,344m), Snowdon (1,085m) and Scafell Pike (978m) in under 24 hours. To round off the charitable success, an eight-strong team, led by director Nina Ramsden, tackled Race for Life’s Pretty Muddy at Tatton Park in Knutsford. Joining thousands of women dressed in pink from across the North West, the group ran the 5km obstacle race for Cancer Research. Nina Ramsden comments: “At 10,000ft altogether, taking part in the Three Peak challenge is no mean feat. Michael did a great job completing this in 22 hours 50 minutes and raising £1,000 for CAFT – our chosen charity at Jefferies Solicitors.